We are often asked how many uses one can get out of a single Challenger System Pad. Depending on how well you care for your bonnets during usage and between jobs, the life of the pad varies. When cleaning with a Challenger Pad, it is extremely important to keep it well moistened. Have you ever felt the heat of the pad or the carpet after a cleaning? This heat is caused by the friction from the pad created by the machine while agitating the carpet fibers. It’s essential that you spray a sufficient amount of Orbit Natural Pre-Spray and make sure your pads are dampened. If you run the Challenger Oscillating Pad Machine over dry carpet with a dry pad, you risk damaging both the carpet and the pad. The type of carpet in which you are working with also makes a difference in the life of your carpet cleaning machine bonnet. Frieze or cut pile carpet creates less friction whereas a looped berber or Commercial Glue Down (CGD) has been found to create more friction. You may find yourself having to change your carpet cleaning pads more often with the latter. It’s important to change your carpet cleaning pads frequently. It is much better to change your pads more often than necessary than it is to damage your pads and the carpet by running them too long. Pad maintenance is also an essential. Wash and dry your pads soon after using them, ideally at some point during the same day of usage. Find a good detergent for the cleaning bonnets and keep it handy in your truck as well as some Borax to mix a small amount into the wash load. DO NOT use bleach on your carpet cleaning pads. You can ruin your pads in just one wash with the use of bleach–it greatly weakens the fibers. 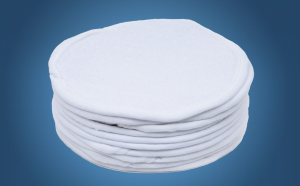 Your pads are most likely not going to appear the same “bright white” after a few uses, but this does not mean they are not clean. The best place to care for your Challenger System Pads is the laundromat. The commercial dryers found at the laundromat help to remove any lint, pet hair, etc. that might have been left on the pad. Use this wait time at the laundromat to your convenience, catch up on some paperwork and return phone calls!